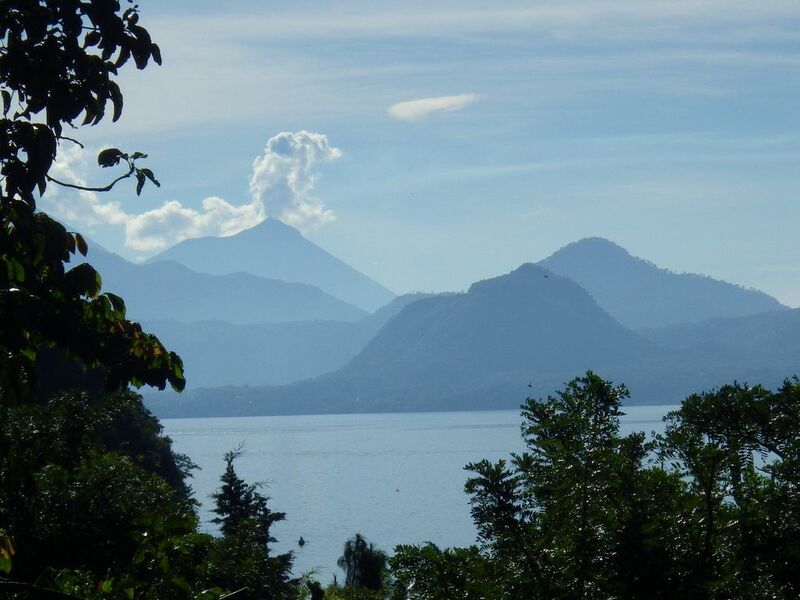 Lake and Volcano view! Entire private house with large, fenced property, no other houses to be seen! Like the entire valley is yours! Road access, no lugging luggage up a steep hill or along a dirt path! Pure water in all taps! No buying water! This rental offers all the comforts of home. Walk in the front door into the open concept kitchen, DR and LR and straight out onto the deck to enjoy the partial lake view and volcanos over the plush valley of trees and birds without a house in site! Also enjoy this view from inside the house through the 6' tall windows. At the road level, you have the front entrance to the house, a roofed 2 car parking spot, a small garden on each side and a shed. Going down the steps between the house and parking area, you will find the beautiful private gardens below. From inside the house, just go down the stairs to find the very spacious bathroom and a large master bedroom with a walk out into the same private gardens. There is also another separate one room building(below parking spot) with a bedroom and bathroom enjoying the same private garden. These gardens include a large collection of flowers, jocote fruit trees, avocado, papaya, matazana, banana and lemon trees. In the LR there is also a sofa-bed for an extra person. You can feel very safe here with an entire house water purification system, alarm system and fully fenced yard. This home provides a very quiet and private space inside and out, located on the easterly side of San Marcos with one of the many hills separating it from the downtown core. This blocks out the typical noises from the town. The road goes to Tzununa, the next town and ends there, thus very little traffic. This home is the only house on this street that you can see. The closest neighbor is 200 m away buried in the plush valley with only a bit of the roof top showing. San Marcos: situated on beautiful Lake Atitlan, San Marcos is well known for the Pyramids Meditation Centre, many holistic and yoga centers, a great choice of international restaurants, mountains to hike, volcanoes to climb, kayaks to rent, a new Tai Chi Center and an authentic Mayan culture that still speaks their own language and wears traditional clothing. This vacation rental is to be enjoyed as such, for rest and relaxation, cooking for one-self. No smoking permitted in house or second bedroom. No pets allowed, no animals to be invited into the house or property. Absolutely no drugs permitted, local authorities will be notified. No groups, classes, courses, or treatments. No renting of parking spaces. No cooking or baking for purpose of sale. Any infraction of these rules will cause eviction and loss of rental balance and damage deposit. pure and hot water for washing dishes, spacious well laid out. Tiled counter top. Extra carbon block filter at sink for making tea or coffee and filling water bottles. inside house with table and chairs, also on the large deck with glass table and 4 chairs. There is a large, 2 level garden in the back of the house with lots of flowers, fruit trees and privacy. The property is all fenced and the neighboring lands I own so there is lots of privacy. to enjoy the partial view of the lake, the volcanoes and the plush valley of trees, birds, and not another house in sight. The large deck is also furnished for enjoying meals. Wonderful cabin — quiet but close enough to town to be convenient Loved the beautiful private garden, kitchen, unlimited drinking water, and hot shower. Jim (owner) and Tom (property manager) were super kind and responsive to questions. A great place to relax and enjoy San Marcos. Casita Quetzal is a great house! It's a great house! The location is awesome, close to town but away from the noisy dogs. The balcony is perfect for watching all the birds and squirrels. I slept very well in the world-class bed, in the very quiet bedroom downstairs. Also I felt very safe there, and it was nice to have the security alarm system. I stayed there a month on a working holiday and fully appreciated having such a perfect HQ. We enjoyed our stay at this house. The location is very convenient—a few minutes walk outside San Marcos village on a quiet stretch of road with no other houses around. Yoga classes at Hostal Del Lago are two minutes walk away. The bright living, dining and kitchen area upstairs has views of the surrounding trees and volcanoes. It leads on to a lovely terrace with a table and comfortable seating with views of the volcanoes, and a little bit of the lake through the trees. The owner had some issues returning our deposit (it took 3 weeks) due to a bank problem, but it seems this has been sorted now so I don't think it should affect future guests.